Some Red River listings may also be found on the Booking.com site. Click the link above! Arrowhead Lodge is located at the base of the main ski area and Pioneer Trail in Red River, New Mexico. This quaint, secluded and quiet lodge has 19 rooms ranging from a hotel room with a queen bed, to a two story townhouse with 3 bed rooms. 12 units have fully equipped kitchens and the other 7 units have microwaves, coffee pots, and small refrigerators. There are charcoal grills and fire pits by the picnic tables. The Arrowhead Lodge is the ideal location for those seeking ski in /ski out accommodations. Located on 5+ acres adjacent to the Red River Ski & Summer Area, Auslander offers many activities that you and your family can enjoy year round. The recreation area has two regulation size horseshoe pits, a volleyball court, and a children's playground area. There is a log fire pit and a newly refurbished gazebo which provides gas grills for your grilling pleasure and elegant lighting for evening dinner parties. There are also charcoal grills scattered throughout the property for that old fashioned smoky meal we all love. We also have a laundry room and ice maker available 24/7 for your convenience. There are two spas and a sauna also available for you to enjoy. Stay at this Red River, New Mexico hotel in the heart of Carson National Forest offering ski-in/ski out accommodations at the Red River Ski Area. The Best Western Rivers Edge proudly features 30 spaciously smoke-free appointed guest rooms and suites, each equipped with pillow-top beds, cable satellite television, wireless high-speed Internet access, microwaves and refrigerators. Guests can begin the day with a complimentary deluxe continental breakfast before hitting the slopes in the winter or mountain trails in the summer. The River's Edge is ideal for corporate events and meetings as the Red River Conference Center is located adjacent to this hotel. Pets are welcome with a $10 daily pet cleaning fee. The Caribel condominiums is your home away from home. Whether you are a vacationing couple, a family or a group, we have accommodations to suit 2 to 6 people. From motel units to 1 & 2 bedroom condominiums. Located on the river and 1 block from the platinum chairlift, you can catch dinner at our private stocked fishing lake or relax in our heated outdoor swimming pool (both seasonal). Guests enjoy a cookout on our gas & charcoal grills located around the property. Coin laundry facilities, daily housekeeping and wireless internet are all included. The Copper King Lodge is your mountain home for skiing and winter fun, summer vacations, and spring/fall get-a-ways. We are on the river in the heart of town next to the Copper Chair Lift. Enjoy our large hot tub adjacent to the river. Our backyard area is on the river with grills, picnic tables and a horse shoe pit. You might just want to sit in our backyard swings or gazebo area and take in the mountain beauty. In the summer our grounds are covered in flowers, that attract butterflies, hummingbirds, and other birds. Don't forget your fishing pole because just outside our back door, the river is stocked with Rainbow trout. The Copper King is one of the premier lodgings in Red River, and you can't beat the value. Give us a call soon, because we fill up fast! 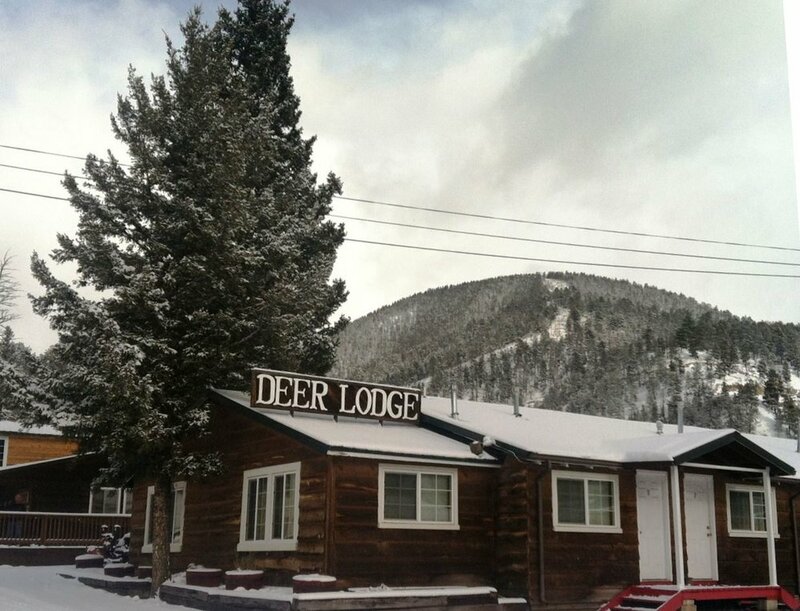 Located at the base of Flagge Mountain, Deer Lodge is 1 block off of Main Street. Our location offers tranquility, yet is conveniently located within walking distance to the Cooper Chairlift, makes Deer Lodge a ski in-ski out convenience. It is not uncommon to see deer stroll through our property in the early mornings and evenings. All our rooms are street level with parking right in front of your door. All rooms are non smoking, but pets are welcome in all our units with a one time non-refundable $20.00 pet fee. We provide DirecTV in all rentals and free wi-fi and wireless Internet is available to all our guests. The Deer Lodge offers comfortable and clean rooms at surprisingly affordable rates. The Double Dog Inn, Red River's only luxury Bed & Breakfast. Enjoy a peaceful nights sleep in one of our 7 king suites. The Double Dog Inn is located on the river and walking distance to all shopping, local eateries and the Ski Area's Copper Chair. The Double Dog in boasts 7 king suites, hot tub and game room. We Double Dog dare you to stay with us. Make the Edelweiss your choice for a vacation condominium. Enjoy every activity from horseback riding to whitewater rafting to ATV rentals, hiking, fishing, cross country skiing, downhill skiing, snowboarding, and much more... These condos are close to Mallette Canyon Park and have a beautiful view of the Red River Ski Area. Stay at Edelweiss during any season and enjoy a quiet mountain get away. Eisenhut has a year round heated pool and hot tub is only 2 blocks away from the Red River Ski Area and located around great shopping and restaurants. Outdoor Activities like hiking, ATV & Snowmobile tours, horseback riding, and fishing are within walking distance. Game Room/Lounge - play a game of pool or sit around our cozy fireplace. FREE Laundry Facility onsite. Six gas grills located throughout our beautiful Courtyard. BBQ all year round. Our non-smoking units accommodate 2 to 12 persons, some with fully equipped kitchens or fireplaces. Our deluxe units have dishwashers, ice makers, disposals, and pillow-top queen beds. Handicapped rooms are also available. The picnic/playground area is equipped with gas or charcoal grills. We are pet friendly for a small non-refundable pet fee. 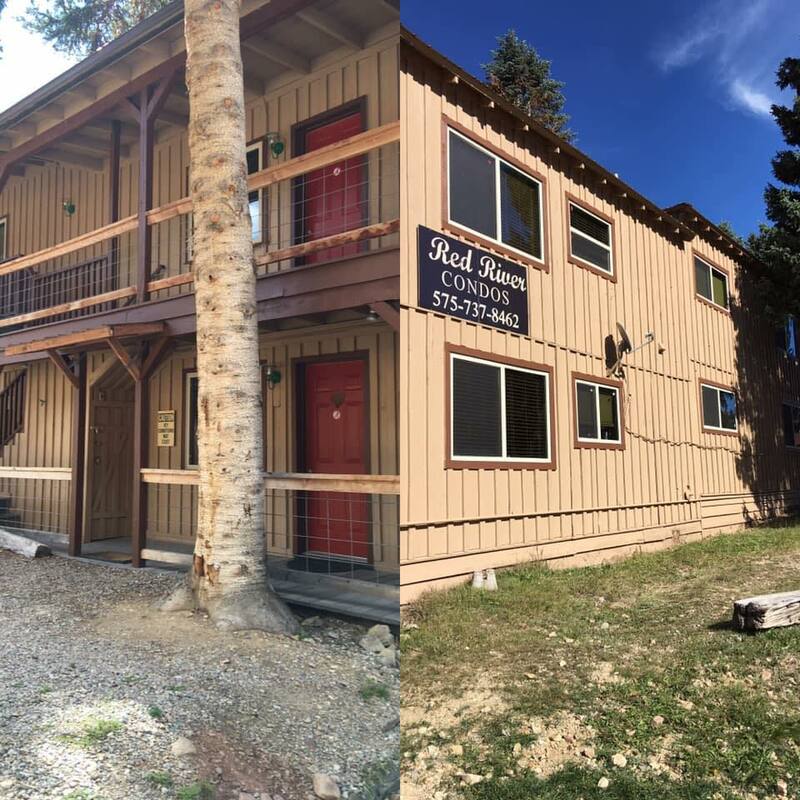 With one unit right in town and one in the Upper Valley of Red River, Heart and Soul Lodging facilities offer the perfect combination of adventure and comfort. Lifts West is the premiere luxury condominium resort in the Red River area, offering many of the amenities of a traditional hotel experience combined with the cozy privacy that comes with staying in a mountain condominium. Perhaps the best feature of Lifts West is the hotel’s proximity – to just about everything. In just a few minutes walk from their rooms, guests can find themselves hopping on a ski lift or strolling down Main Street for dining, live music, a festival, or a parade – or heading to the local grocery store, when it’s time to pick up a few essentials or stock your private kitchen. The lodge has 24 guest rooms located above Texas Reds Steakhouse with a private common lobby, entertainment center, and a game area, with authentic knotty pine for a warm comfortable atmosphere. The Lodge at Texas Reds provides leisure like no other. Grab a drink at the Lost Love Saloon or sit down for a luxurious steak, all located right under your feet! The location also provides an "at home" atmosphere with shopping, skiing, and dining all a stone's throw away! We are conveniently located in the center of Red River so it is a short walk to restaurants, shopping, and other activities. We hope that a stay with us will evoke a desire to return not only to New Mexico but to Red River and the Ponderosa Lodge. About half of our guest rooms have fully furnished kitchens as well as a wood burning fireplace (we furnish the wood). We have satellite TV as well as free wireless Internet in the rooms. Guests are encouraged to take advantage of the on-site hot tub, especially during the winter months. There are some “pet friendly” rooms available for a nominal nightly fee. Looking to make this vacation to Red River the best one yet? With approximately 100 unique and one of a kind properties you will have no problem finding the perfect fit. With sleeping arrangements of two to twenty-four persons we can fit parties of all sizes. We manage anything from small one bedroom town homes up to nine bedroom homes for those large family reunions! Ever spent the night in a "yurt"? Try out this unique housing experience at Red River RV Park. The river runs through this quaint property so bring your fishing gear or a good book and take in all that Red River has to offer. If you have an RV and are crusing through town be sure to spend a night here and relax at Red River RV Park. Reservations Unlimited offers a wide selection of vacation rentals in Red River to frame the perfect setting for your mountain retreat. Among our diverse offerings are rustic cabins and riverside lodges, spacious condos, comfortable homes, and well-appointed townhouses. Whether you want to join in the town hubbub or just get away from it all, the choice is yours. There's no single right way to enjoy Red River, and we want to help you find your ideal lodging option. Welcome to the Resort Properties of Angel Fire, your ultimate destination for vacation rentals in Angel Fire, New Mexico. Our fully furnished vacation properties can accommodate couples, group trips or large family reunions with a number of flexible capacity options. From condos and studios to larger homes spread across the Village of Angel Fire, you're guaranteed to find just what you're looking for. Access the ski-hills, hiking trails, Monte Verde Lake and Angel Fire Bike Park with ease from the convenient locations of our Angel Fire Resort properties. Long-term rentals are also available. 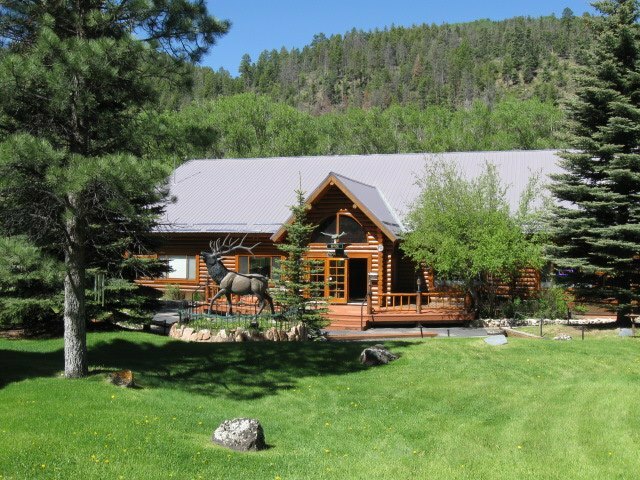 We have 20 smoke-free cabins (1, 2 and 3 bedroom) located on 5 acres in the beautiful Sangre De Cristo Mountain town of Red River, New Mexico. For over 70 years our goal has been to help you and your family create a unique and memorable vacation experience! Even though these are rustic mountain cabins, they still have all the amenities you will need to have a comfortable and pleasant stay. All of our cabins include flat screen TVs in the living room offering cable. The kitchens include pots and pans, a set of dishes, silverware and utensils, dish soap, dish towels, a toaster, microwave, refrigerator, stove, coffee filters and a coffee pot. Home to the historic Orrin Mallette Cabin, River Ranch offers 5 apartments, 5 rustic cabins and many RV and tent sites to choose from. The Red River runs through the campground, and is alive with a variety of trout. There is also a well stock pond that makes this campground a fishermen’s paradise. RV sites come in 30 and 50 amp and have electric, water, sewer, and TV hookups. There are different areas in the campground. The Grove area has tall trees and a diversity of song birds. On river side you can sleep to the sound of the babbling waters of Red River. North Lake is our newest section and features easy access to the pond. All the sites have picnic tables and fire rings. Facilities available include bathhouse, coin-op laundry facilities, dump station, and fishing pond. We have 30 units that we refer to as the “cabins” or condo-type units, they range from one to three bedrooms and are each equipped with a fully stocked kitchen (dishes, silverware & basic cooking essentials) with a microwave and a coffee pot; a living area that is furnished with a television, DVD player and a telephone. Fireplaces (gas log or wood burning) and dishwashers are available in some of these units (wood is provided); please see our “rates” page for unit's detailed descriptions. Our lodge and cabin/condo type units form a horseshoe with a hot tub and the playground centrally located for the safety of the small ones. Our heavily wooded 23 acre RV Park is nestled in the beautiful Red River Valley with the Red River running through the middle of the Park. Our RV sites are large enough to allow the abundant space for any type of RV/camper and all sites have water, electric, sewer, and direct TV will be available soon. There are also BBQ grills, picnic tables throughout the park for everyone to enjoy. Be sure and bring your tennis rackets and take advantage of our state-of-the-art tennis courts. Our large office complex provides many added amenities – including a convenience store, gift shop and RV supplies for our guests. Sitzmark Sports & Ski Resort is located in the heart of Red River. We offer winter lodging, cabins, vacation rentals, and is the premier ski rental and snowboard rental headquarters in Red River. Lovely 1200 SF 2-BR, 2-BA, sleep 6 to 8. Most units recently remodeled. Located two blocks from the slopes. Near shopping with in-town transit. Fully equipped kitchens, fireplaces, covered deck, DIRECTV, some w/DVRs. Free Wi-Fi. Common area includes picnic and BBQ grills with propane bottles furnished. Newly added game-room with table tennis, foosball, shuffleboard and lots of table games with coin operated laundry facilities for your convenience next to the game-room. All units are nonsmoking. No pets. You’ll find unrivaled peace and serenity at the St. James Hotel in Cimarron, New Mexico. For historic rooms and delicious food, stop by anytime. The Terrace Towers All-Suite Lodge is terraced up the mountainside providing the best views of the town and the Red River Ski Area, yet it is only a 5 minute walk to the center of Red River. Each of the lodge’s 16 units have 2 bedrooms, private bath, living room and a full kitchen. With it’s knotty pine interiors, this authentic 1950s style lodge takes you back to a time when vacation was all about making yourself at home and just relaxing, with all the modern conveniences, including free wireless internet. Just move in and let the relaxation begin! And yes, pets are always welcome! When you want a break from the summer heat, the mild days and cool nights during the beautiful spring and summer seasons are ideal for outdoor adventure. Try fishing, hiking, four wheeling, horseback riding, whitewater rafting – or maybe even a hot-air balloon ride over the breathtaking Red River valley. If winter sports are what you crave, we can take the hassle out of getting you to the slopes. Forget loading the car, driving to the ski area, parking and standing in line for lift tickets. Take advantage of the chairlift located just a few yards away from the Three Bears Lodge. The lift services the entire mountain, so when your skiing day is done, ski right back to your vacation cabin. We offer all the amenities to make your stay in Red River truly a vacation. We are in a quiet neighborhood, yet close to downtown & the ski area. All the units have fully equipped kitchens, fireplaces, free Fiber Optic High Speed WIFI, Dish Network TV, washers/dryers, porches & balconies. Some have adjoining doors & one unit has 5 bedrooms. We have 2 great covered hot tubs & 3 propane grills. At creek-side there are picnic tables, BBQ grills, benches & a playground. Kid friendly items and lawn games are available for check-out during your stay. We provide toilet paper, paper towels, trash bags, shampoo, conditioner, lotion, bathing/dish soap, & coffee. There is a regular schedule of trolley service into town. We participate in the Kids Stay Free/Ski Free program. To help make your vacation complete, Wild Bill’s also offers three wonderful units available for nightly rental. The Pueblo, Durango and Zia are each unique and inviting with those little extras such as 37 inch flat screen TV, iPod/CD player, and coffee maker. Two of our rooms have fully equipped kitchens! We use high thread count sheets, down comforters, really comfy feather pillows and nice, fluffy towels. If you want to feel like you are at home, then Wild Bill’s is the place to stay! Woodlands on the River is a 24-unit condominium resort on the outer edge of Red River, NM. Woodlands is riverfront property with condos only steps away from the river. Our location provides a serene escape with convenient front-door trolley service to nearby fine dining, shopping, skiing, and other attractions. We offer many amenities that will make your stay memorable, as well as comfortable. No pets, please. If you're looking for the convenience of ski-in/ski-out lodging, your WorldMark resort in Red River, New Mexico, may be just the ticket. Located at the base of the Red River Ski and Snowboard Area, your resort is just 30 feet away from the nearest ski lift and only three blocks from the ski area's main entrance. In addition to skiing, you can also partake in snowboarding, snowshoeing or snowmobiling.